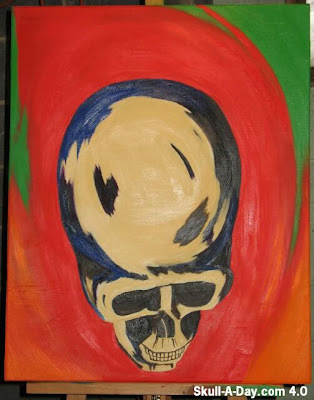 Dominic Borelli from Middlesex, NJ sent us this painting of a skull. I am not sure of your origional intentions on this piece, perhaps you were only merely capturing the reflection from an over head light source, but when I saw this I thought of the classic “The Midnight Sun” episode of the Twilight Zone. My thoughts also turned to all the Egyptian art in which the sun-disk imagery is portrayed as part of the headdress like the goddess Hathor. Thank you for submitting your work for us to share. I reminds me of an elongated Nazca Skull, if you were looking at the top of one.